With a new courtyard, new tenants and a multimillion-dollar facelift, a pair of developers hope to turn a 1950s retail strip in Park Hill into a shopping destination to rival Old South Pearl and Old South Gaylord. Developers Todd Snyder and Rick Firmine plan to start construction on Oneida Park, a retail strip on both sides of Oneida Street between East 22nd and 23rd avenues, as soon as this summer. 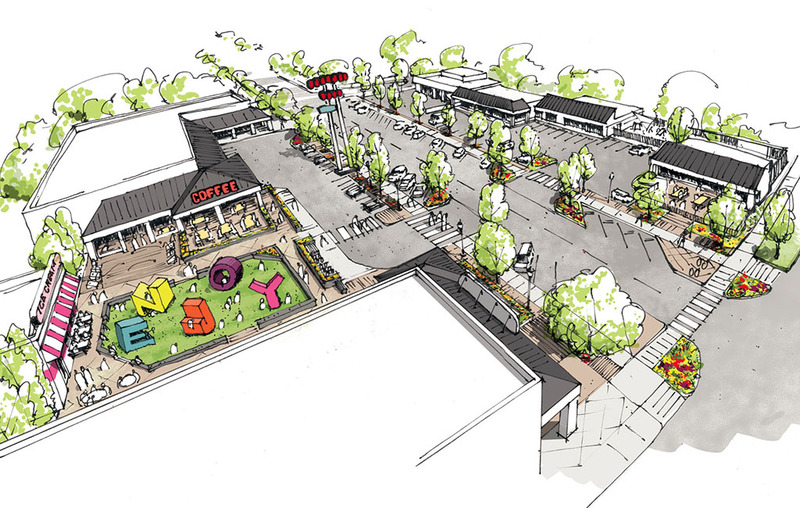 The pair has signed two restaurant tenants to anchor a courtyard slated for the west side of the shopping center: an ice cream concept by the owners of Little Man Ice Cream and a second location for Ester’s Neighborhood Pub. Unlike a nearby retail strip on Kearney Street, which is owned by several parties, Snyder and Firmine own most of the real estate on both sides of their block. City records show that the pair, acting as Oneida Park Owner, acquired Oneida Park for $5.3 million in January. Oneida Park Owner received a loan for up to $4.6 million from Guaranty Bank and Trust Co. in concert with the sale, according to Denver records. The seven-building Oneida Park complex includes 30,000 square feet of retail spread over nearly 2 acres. The strip is more than 80 percent leased, Snyder said, with tenants like Allegra’s Pizza on the east side of Oneida and Spicy Thai II on the west. Snyder, also a broker with NAI Shames Makovsky, is marketing five of 15 storefronts for lease. He did not disclose current tenants’ lease rates or durations. Including site acquisition and renovations, Snyder said, the group will spend $10 million to revamp the block. The developers do not plan to alter Oneida Park’s retail footprint. But on the west side of the street, Snyder and Firmine plan to turn a surface parking lot into a 7,000-square-foot courtyard ringed by restaurant tenants, including Ester’s and a to-be-named Little Man spinoff. Snyder is looking to lease a third storefront facing the courtyard to a coffee shop. Dig Studio is the landscape architect for the courtyard and Ware Malcomb is the project’s civil engineer. Snyder envisions courtyard performances by students at the nearby Denver School of the Arts, a pumpkin patch in October, a Christmas tree lot in December and farmers markets in between. The ice cream shop and Ester’s will move in next year, he said, and construction should be complete by summer 2018. “We have really high hopes and expectations to reposition this center into a great gathering place,” Snyder said. Snyder said the pair will relocate parking displaced by the courtyard to a spot behind retail on the east side of Oneida.